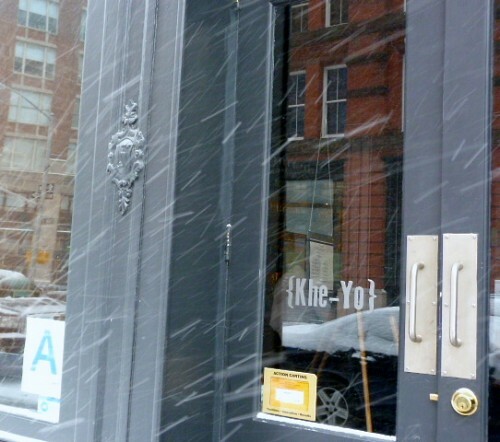 Posted by Andrea H at 10:00 am, January 27th, 2014 under Khe Yo, Sandwiches, Seafood, Tribeca, Vietnamese. The name of the restaurant Aux Epices on Baxter St. (btw. Canal & Hester) translates from French into “with spices” and that was an accurate description of the riot of flavors in my lunch there. It moved from Tribeca where it was called Franklin Station Cafe, and there isn’t much on the lunch menu that tops $10, but you have to remember that this is Chinatown/Little Italy and that price point is expected. You don’t feel like you’re eating in the neighborhood as you step inside and black and white photos paired with cute cafe tables and French music contrast with the mostly Malaysian and Asian dishes on the menu. It’s a nicer lunch experience than you might find in surrounding establishments, and the seafood dish I had was delicious. 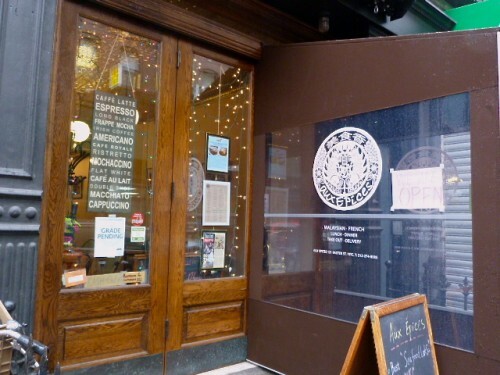 Posted by Andrea H at 10:00 am, January 8th, 2014 under Aux Epices, French, Little Italy, Malaysian, Noodles, Seafood, Soups. We have a lot of new restaurants that open downtown that are pretty far outside of Midtown Lunch’s price boundaries of $10. When Route 66 Smokehouse announced its opening I took a peek at the menu and saw a bunch of items that sounded delicious including a pulled pork BBQ sandwich that I’d already tried at a pop-up, brisket, and a fried oyster po’ boy. The last one is pretty rare in Lower Manhattan, although you can find an awesome shrimp and oyster po’ boy at Cheeky Sandwiches on the Lower East Side. Posted by Andrea H at 10:00 am, November 4th, 2013 under Financial District, Route 66 Smokehouse, Sandwiches, Seafood. 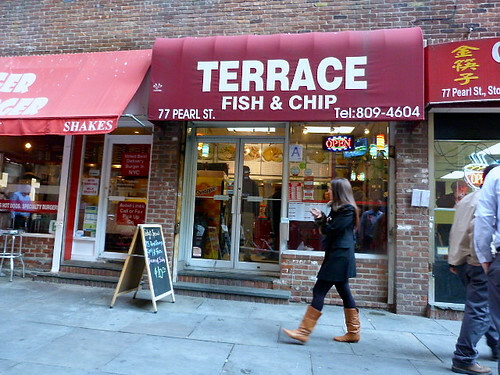 Posted by Andrea H at 10:30 am, October 31st, 2013 under Financial District, Sandwiches, Seafood, Terrace Fish & Chip. 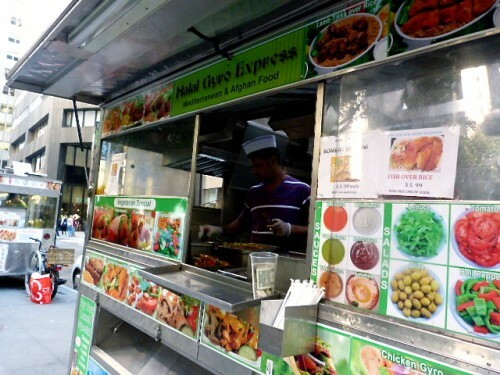 Posted by Andrea H at 10:00 am, October 21st, 2013 under Cart, Financial District, Halal Gyro Express Cart, Seafood, Street Meat. It’s summer and when it’s hot outside sometimes a room temperature lobster roll sounds like the only thing good to eat, besides ice cream. 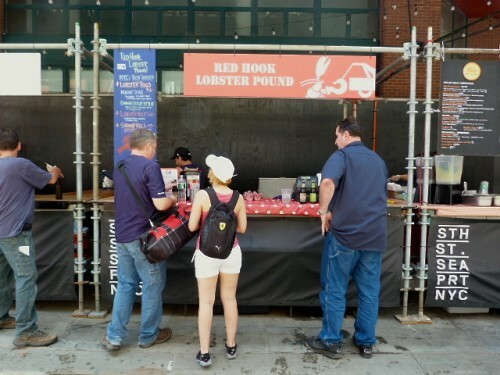 The problem is if you go to the Red Hook Lobster Truck, Luke’s Lobster or any other place that serves seafood stuffed into toasted hot dog buns, you’re going to pay $15 or more for the privilege. 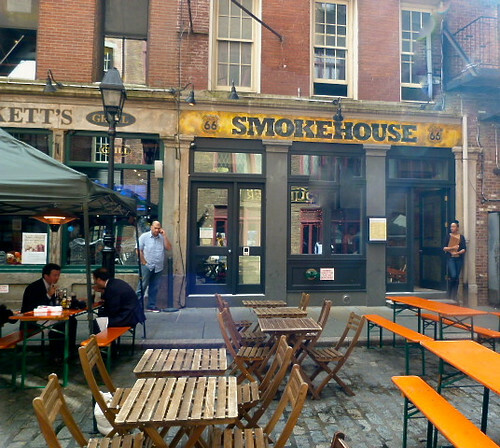 Posted by Andrea H at 11:30 am, July 11th, 2013 under Red Hook Lobster Pound, Sandwiches, Seafood, South Street Seaport. The pernil and other meaty products from Sophie’s Cuban (Multiple Locations) get most of the attention, but they also offer a few seafood options on their daily menu, and a couple of special dishes on Fridays. If you want to get lunch for less than $10, the fried fish special will not only fill you up, but it’s pretty good if you make one important addition. 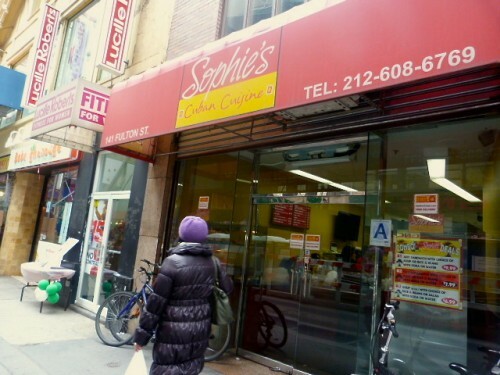 Posted by Andrea H at 12:00 pm, March 25th, 2013 under Cuban, Financial District, Seafood, Sophie's Cuban, Tribeca.